The company hopes to woo buyers by adding HDR support to almost all of its 2015 4K TV lineup and throwing in a bunch of remastered blockbusters. 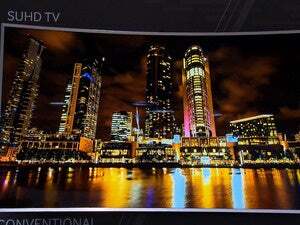 Sony has decided to bring HDR ( High Dynamic Range) support to more of its latest 4K TVs. The company had originally planned to deliver the much-talked-about feature to the X930C and X940C models only, but the Japanese consumer electronics manufacturer now says its X850C, X900C, and X910C models. Will also get the HDR treatment. According to the company, the eligible models will receive a firmware update very soon. That’s all fine and dandy, but what about content? For a limited time beginning this fall, Sony will include $100 worth of HDR-mastered films with the purchase of these sets. The free titles—all of which will be available through the Amazon Video app—include The Amazing Spider Man 2, Men in Black 3, After Earth, and Fury. Amazon Prime members will also be able to access some of Amazon’s in-house content in the new format, including the first seasons of Transparent and Mozart in the Jungle,and the pilot episode and first full season of the upcoming comedy Red Oaks. Why this matters: 4K may be all the rage, but goosing pixel counts without addressing the quality of those pixels will take you only so far. HDR accomplishes this by boosting the contrast between the brightest and darkest elements of an image to a point where the details begin to pop out at you. It delivers stunningly lifelike visuals with whiter whites, blacker blacks, and richer and brighter colors than what we’re currently used to. For whatever reason, Sony remains tightlipped regarding a key aspect of this firmware update: Will it include support for HDR playback from external sources—such as Ultra HD Blu-ray players—or will it be limited to online sources. It would seem that a key stumbling block is that none of the TVs in this range is outfitted with HDMI 2.0a, which is required for transporting HDR metadata over an HDMI connection.